Somerset County, west-central Maine, U.S. It consists of a mountain-and-plateau region bordered by Quebec, Can., to the northwest and drained by the Moose and Kennebec rivers. Other waters include Flagstaff, Seboomook, and Brassua lakes. The Appalachian National Scenic Trail traverses the county between Bigelow Preserve on the west and Bald Mountain on the east. Major forest types are spruce, fir, maple, birch, and aspen. Somerset county was organized in 1809 and named for Somerset, Eng. Skowhegan is the county seat. 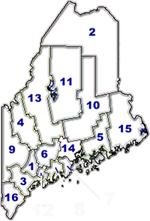 The principal communities, including Fairfield, Madison, Pittsfield, Norridgewock, and Anson, are located in the southern reaches of the county. The economy relies upon logging, paper milling, and tourism, including hunting and fishing. Area 3,927 square miles (10,171 square km). Pop. (1990) 49,767; (1996 est.) 52,507.